Later we moved and could convince locals we are coming with real support. 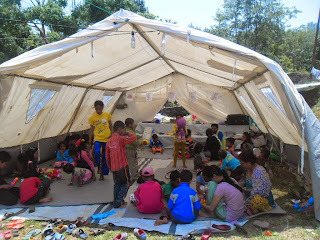 We reached the local office of Balmandir (gov office caring for children) and we could stock our materials and managed the tents. Today morning we started the camp and assessement of the situation (to bring additional materials). There is a correct coordination with the CDO office, DCWB, DDC, Police and ward office.